I wanted to do a regular series on my blog, something unique that hasn't been done before. I came up with an idea to feature small shops, that are located throughout the country. So, every Friday you can stop by and check out a new shop, and at the same time meet the owner. Today, we will be shopping at Home Sweet Home. The two owners of this shop really know a thing or two about VINTAGE GOODNESS! Susan and her mother Sharon have one charming shop, and I am tickled pink to share it with all of y'all today at SHOP TALK. 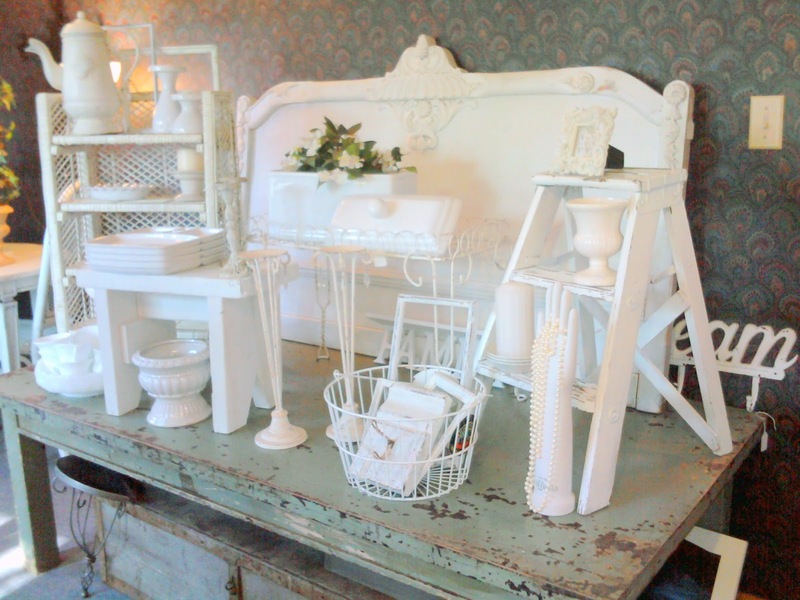 After you finish drooling over all the goodies, please be sure to go by and check out Susan's blog...MUST LOVE JUNK and their facebook page for HOME SWEET HOME. I'm so honored that Linda has asked me to be a part of her Shop Talk! I really enjoy reading about other shops, and I'm happy to be included in this series! My grandma owned a variety of antique stores in Tennessee throughout her life, so I guess it's in my genes! My mom and I made our dream a reality about 8 years ago. My hubby and I were moving back to my hometown after living about 2 1/2 hours away the first 6 years of our marriage, so mom and I decided that this was the perfect time to pursue our dream. But like so many things do, this turned out to be a blessing in disguise! While we were still discouraged about losing the location that we wanted and trying to figure out where to look next, the home right next door to my parents became available. My parents own this home as a rental, and the renters were going to be buying their own home so they gave their notice. My mom had owned a clothing shop here for awhile in the 90's (hence the awning which has since been removed) so it was already zoned for commercial use, but we wondered how a vintage home goods store would do in this location. It's a quaint little brick bungalow, but a bit off the beaten path in a residential area. After praying about it we decided to go for it! We opened the shop here, and we've never looked back! 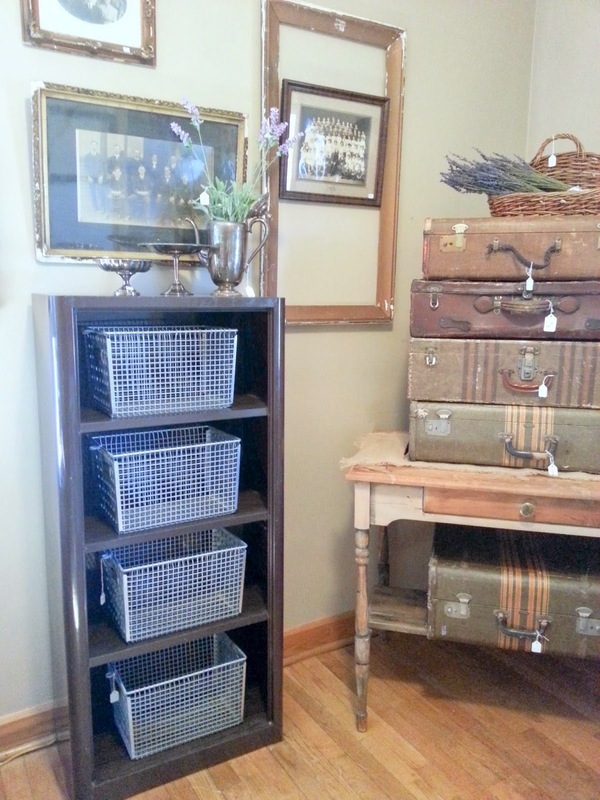 So on most days we are out 'junkin' for the shop, and we are only open on Fridays and Saturdays. We were pioneers back in the day when we started, with our unique location and limited hours. (There was only 1 other shop-a florist-in our area back then.) Now there are 4 other shops within walking distance of ours with similar hours, so our little berg has become a fun shopping destination! When we first opened, the aesthetic inside wasn't ideal...the walls were wallpapered and dark as you can see here, and the kitchen still had its appliances. Also, the kitchen cupboards and ceiling had outdated stenciling on them. At first we worked with what we had! Then a few years ago we gave the inside a fresh makeover. We painted the walls a light neutral color, added some pretty light fixtures, removed the kitchen appliances, and painted the cupboards with chalkboard paint. It made such a difference! Now the shop is light and bright. We're lucky to have a local girl who makes wonderful candles for us. They smell amazing, and we can barely keep them in stock! We also opened our Etsy shop 'must love junk' about 3 1/2 years ago. 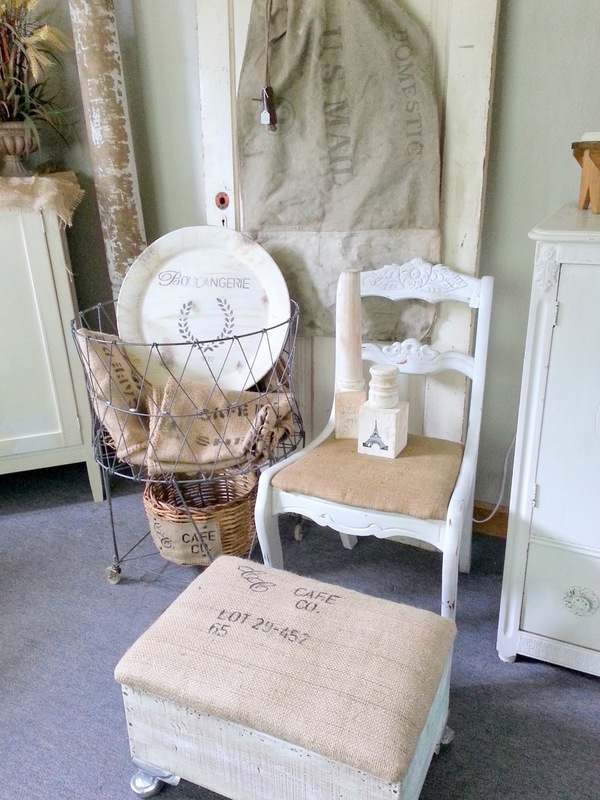 We list mostly farmhouse and industrial style smaller items on it. My mom and I feel so blessed that we've been able to do what we love all these years! We've met so many wonderful people and have developed such a loyal following. We're constantly bringing in new fun finds, and we change the shop around every week to keep it fresh for our fantastic customers. It's a lot of hard work, but we have so much fun with it! I hope that you all enjoyed a glimpse into our shop! Thank you, Linda, for having me here! I would love to come to your shop. It looks like a wonderful place to spend time with a girlfriend. Love the shop! Wish I was closer, I would be there every weekend to check out the goodies. So well displayed. What a wonderful little shop! I'd love to visit someday. :) Thanks for sharing! What a great story behind Susan and her Mom's shop. When I lived in NY, there was a home shop that was a house at one time. They kept the traditional rooms and set up their items so the kitchen had kitchen décor, they did a bedroom with a bed display that had linens and pillows, etc. It was a great little shop and I was sorry to see them close. Thank you again for featuring a wonderful shop!! Wish I lived closer! Susan and her mom's shop has so much eye candy!!! I know if I lived closer I'd never come home empty handed. Loved learning the story behind the shop. Love your story, Susan and love the feature, Linda. What an ideal location for establishing your little berg - dreams CAN come true, can't they?! Well isn't this neat! A fellow Ohioan - making me so proud! Your shop is AWESOME - and you and your Momma are gorgeous. When you lived 2.5 hours away, was it Columbus, by chance??? I am north C-Bus. My hubs grew up in Akron, not far from you at all! One of these days - on the weekend- I am going to come see your shop and introduce myself. Be a fun day trip for sure. Best of luck and success in your enterprise. GREAT post! I love the exterior of that house! and the interior is so charming now with all the goodies displayed. Beautiful!!! Thank you for sharing! I always enjoy it when you feature shops Linda, since virtual shopping is one of my most-loved habits! This one is just sweet and perfect - in love with that birdcage console!!!!! 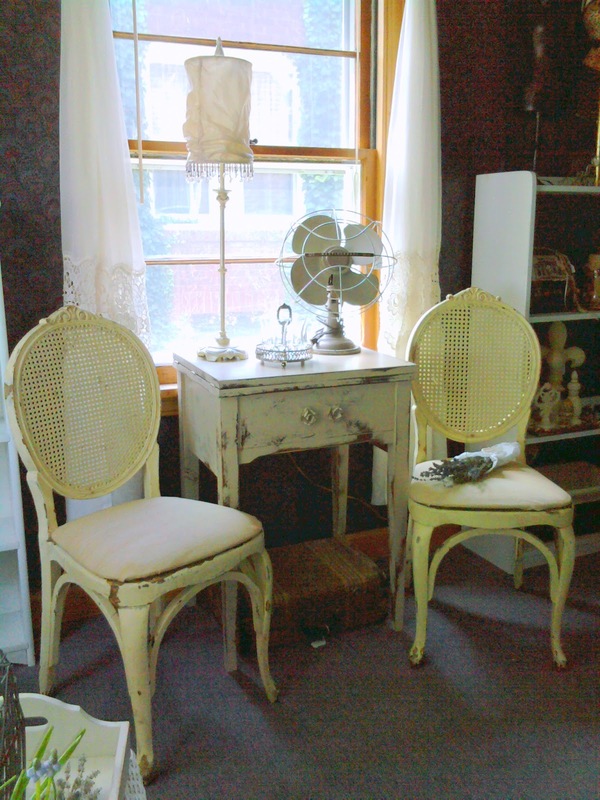 I always enjoy seeing Susan's beautiful vintage treasures and creative vignettes. Love this sweet shop and wish we had something like this in our neighborhood. It's a wonderful looking shop! All styled so well. I would LOVE shopping there! Thanks to both of you for the peek! LOVE seeing their shop, how fun that it's in a great little bungalow! Looks like a shop I would love to visit! What a wonderful post !! I love susan's style ! What a darling shop !!! I loved the tour through Susan and Sharon's shop! I like the idea that it's located in a home, too. I wish them great success in their venture. There shop is full of so many unique items. I just wish I lived close enough to visit! That's such an interesting story. I like that there are other shops in the neighborhood now. Oh Susan, you and your Mom have such a cute shop. I so wish I lived closer, but Ohio isn't that far! Just looking at the photos I could see many items I would buy, and hubs is happy we don't live close. What a great story on how your shop became a realty. I loved seeing Susan's beautiful shop. I live in the same state as her and hope to make a visit there some day. Love that Linda is featuring you and your Mom's shop! Also love the setting, so homey and you girls are very talented stylists!! You two are very lucky! Oh your shop is amazing and I love that you get to run it with your mom! It's so quaint and filled with the most awesome treasures. A dream come true! Wish I were there! Susan, you and your mom are beautiful! What a great picture and what a great team you make. You're right the shop thing was a blessing in disguise because how awesome is it that you have no overhead and it's so close by! I love your shop and all of the contents. :) OH yeah, I also love the chalkboard cabinets! Great Job Susan and Thanks Linda for this guest post! Such a lovely shop……so inviting. What a fun photo tour of your mom and pop shop, literally in your case! It's nice that you and your mom have perused your dream together. That is the quaintest little house for a shop. I really like it! It reminds me of something you would see off mainstreet in a small country town. Love your working hours too. So nice not to have to be tied down to it all day every day. Your story is every bit as charming as your shop! Thanks for sharing another piece of yourself with us, Susan. Love your shop - it's adorable. I hope to have a shop like this in the future. These are my favorite shops. I love little bungalows and for a shop I think it is perfect - it's a little home with things for your little/big home. LOVED hearing the story of your shop, Susan! I know lots of women dream of doing what you and your mom are doing and it was really fun to hear how it all came together for you. Such wonderful inspiration for aspiring shop owners! Thanks for sharing Susan's shop, Linda! This is a great series! Love your shop and it is so awesome that you and your Mom share in your adventure. I would love to shop there! Road trip!!! I love Susan and her blog and her shop is just as gorgeous as her home...how wonderful that she and her mom can do something they love together! I enjoyed the overview of Susan's Shop. I have had a shop for 27 years so it was fun to see hers. Oh Susan I love seeing all the wonderful pictures of the shop. The pic of you and your mom is gorgeous of the two of you. I see lots of treasure I would buy in that great shop. I wish I lived closer. This looks like such a wonderful shop...and so fun to own! Thank you for sharing! such an adorable shop..inside and out! 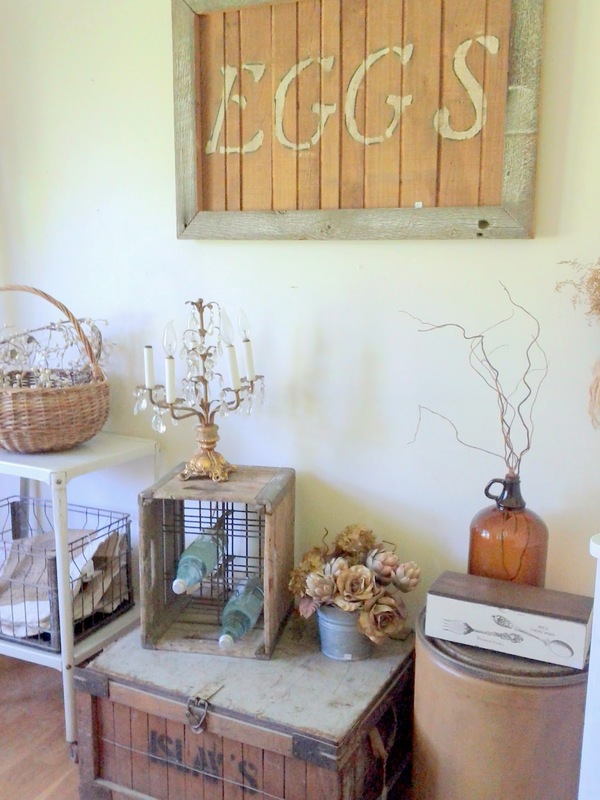 love susan's talent for mixing different elements into charming vignettes!